A fishing boat got its net caught on a BC Ferries vessel en route to Nanaimo Wednesday, dragging the boat for a distance before the line snapped. The incident happened on a 3:15 p.m. sailing from Tsawwassen to Nanaimo on the Queen of Alberni. BC Ferries says the boat was nearing Duke Point terminal at Entrance Island when it came upon roughly 75 commercial fishing vessels that were participating in a two-day fishery. The boats were blocking a marked ferry channel and ferry crews were forced to idle while they figured out how to traverse the waters, according to BC Ferries spokeswoman Deborah Marshall. Passenger Tricia Bryant, who was heading home to Port Alberni, said she didn't realize what was happening until the ferry's engine turned off before it docked. "We looked out the front and there were just dozens upon dozens of fishing boats. Small, little fishing boats in front of us," said Bryant. "None of the fishing boats seemed at all interested in moving for the ferry, or moving their nets for the ferry, and we actually had to weave the ferry boat in between these small fishing vessels." That's when Bryant looked out a side window and saw the entangled boat. 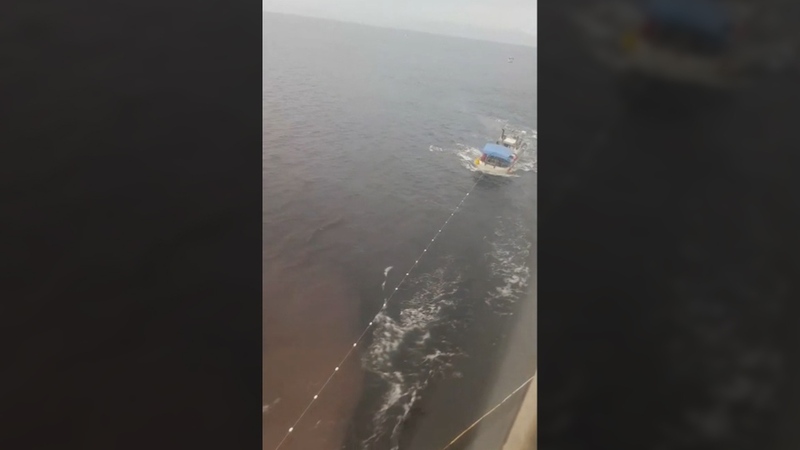 "There was a boat that had a fishing net strung across the ferry route that was partially submerged, and nobody saw it until we were on top of it," she said. She shot a short video of the boat apparently being towed by the ferry before the line snapped. "I was just anxious and thinking cut the net or you're gonna go under," she said. Marshall said the ferry crew tried to radio the boat that got caught, but no one on board responded. The vessel ended up reversing to free itself from the net and continued on to Duke Point. BC Ferries has since reached out to the Department of Fisheries and Oceans, which will follow up on the incident. "We appreciate the fishermen, they don't want to lose their net either," said Marshall, adding that incidents like this have happened in the past but are rare. Bryant had sterner words for the fishing boats that seemed reluctant to clear the way. "Just a complete lack of safety and regard for everybody else. They were focused on their fishing and nothing else," she said. "They didn't care." She also said the incident ended up delaying the sailing by about 30 minutes. Bryant said she was impressed with how ferry staff handled the incident, and that she hopes it will result in fines for any boats there were blocking the vessel.